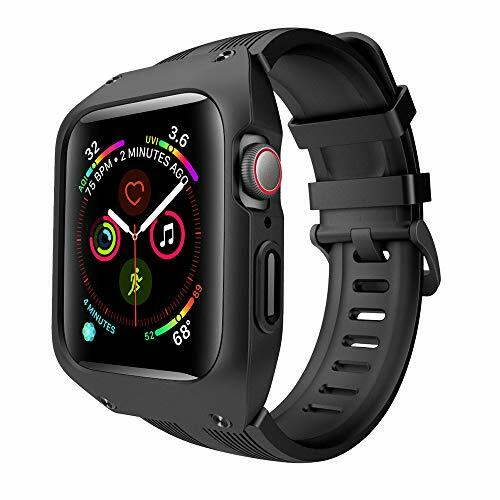 OXWALLEN Liquid Silicone Band for Apple Watch 44mm with Case Just for Your Apple Watch 4 44mm. *Your Apple Watch 4 can do everything but protect itself. *That's where the LS for the 44mm Apple Watch 4 comes in. *The LS's tough, rugged look isn't just for show-Polycarbonate and ABS pack serious, military-grade shock-resistance. slightest, as it was designed specifically to keep your Apple Watch 4 performing at peak levels. *Combine all this with simple, fast installation, and full compatibility. Installation is as simple as removing your current strap or case, and snapping the watch body into the LS. The LS was made to be, and look, tough as nails. Not buttons, screen, or sensors are hindered in the slightest. ABS and Polycarbonate come together to resist any drops, slams, sweat or falls. Hand-made quality straps, make your watches more tasteful!